Catananche caerulea, the Cupid's Dart, will put a blue flower sparkle in the late Spring and Summer garden and may even bloom into the Fall if the dead flowers are stripped. Cold is unlikely to be a problem in our area. But Cupid's Dart plants generally don't live very long. They are small plants, catalogs say 18 inches to 2 feet but in our gardens Catananche caerulea has been more like a foot tall. We have grown the Cupid's Dart in sun and light shade. There are a lot more flowers in full sun. Drainage is critical. And because the Cupid's Dart plants are tender they should not be planted in high activity areas that balls or the dogs that follow them will stray into. 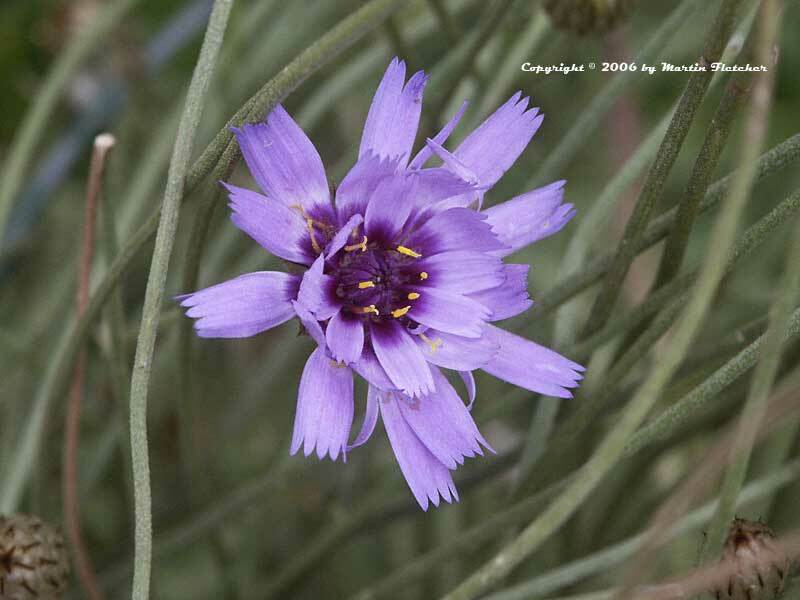 Flowers and foliage of Catananche caerulea the Cupid's Dart. High resolution photos are part of our garden image collection.